Do you want new hymnals for your parish? Explore best practices used by expert music ministry directors. The decision to purchase a hymnal is a significant one for any parish community. It’s not only a sizable financial investment, but also a decision that will impact your music ministry program for many years to come. 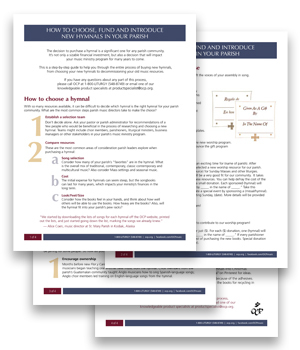 This is a step-by-step guide to help you through the entire process of buying new hymnals, from choosing your new hymnals to decommissioning your old music resources.